Sometimes I have a Grinch moment, and I think “healthy seasonal food in the winter is ugly, and boring, and difficult, and time-consuming to prepare.” But I know that’s not the truth. 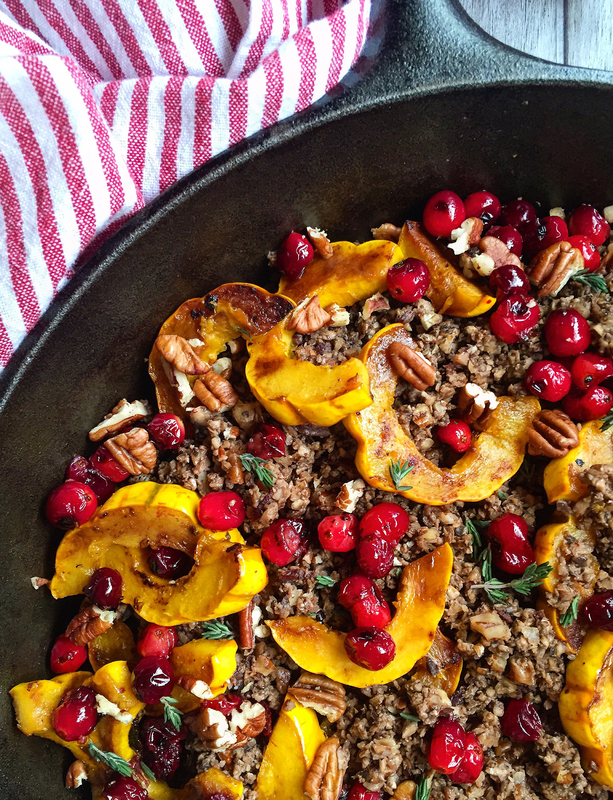 Many traditional favorites do rely on truckloads of sugar in various forms to liven them up (pumpkin pie, pecan pie, cranberry sauce, sweet potatoes loaded with marshmallows) but there’s beauty and ease and nourishment to be found in real seasonal food during the winter months, too. 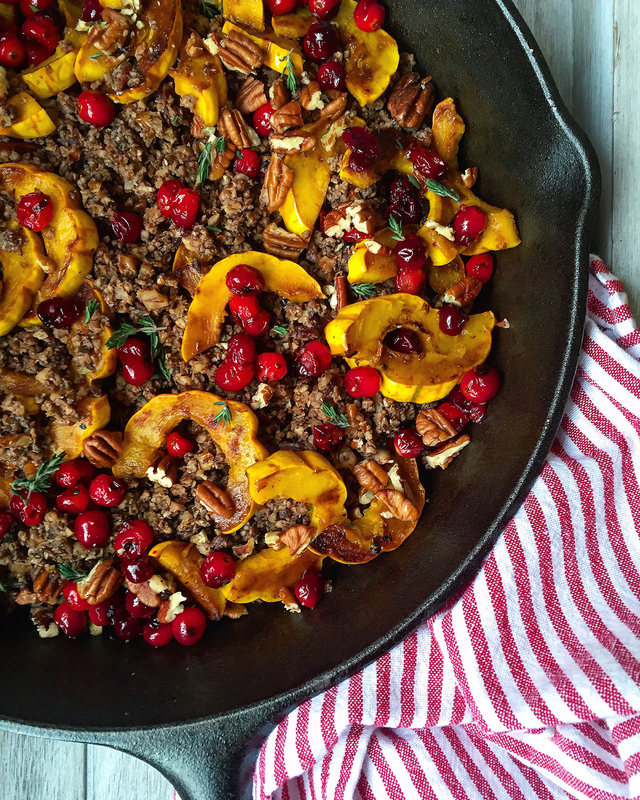 This Duck Bacon Winter Hash pairs duck bacon’s rich depth of flavor with the warm vegetal umami of mushrooms, the subtle sweetness of winter squash, and the bright tartness of cranberries for a comforting result that’s festive enough for the holiday table. In a dry skillet over medium heat, cook the bacon until crispy then remove to a paper towel-lined plate to drain. Slice the delicata squash open lengthwise, and scrape out the seeds with a spoon. Slice each squash half into half-moons about ¼ - ½ inch thick. Cook in a single layer in the hot bacon fat for 2-4 minutes on each side, in batches if necessary, until browned and soft. Remove and set aside. Add a tablespoon of coconut oil or other fat of choice if the skillet is dry, then cook the cranberries in the bacon fat, stirring occasionally, for 3-5 minutes until beginning to split and soften. Remove from the skillet and set aside. While the cranberries cook, load the mushrooms and cooked bacon into a food processor and pulse to a fine shred. Alternatively, dice very finely. When the cranberries have been removed from the skillet, add the second tablespoon of coconut oil if the skillet is too dry and cook the mushroom and bacon mixture with the salt and pepper until soft, reduced in size, and beginning to render moisture. 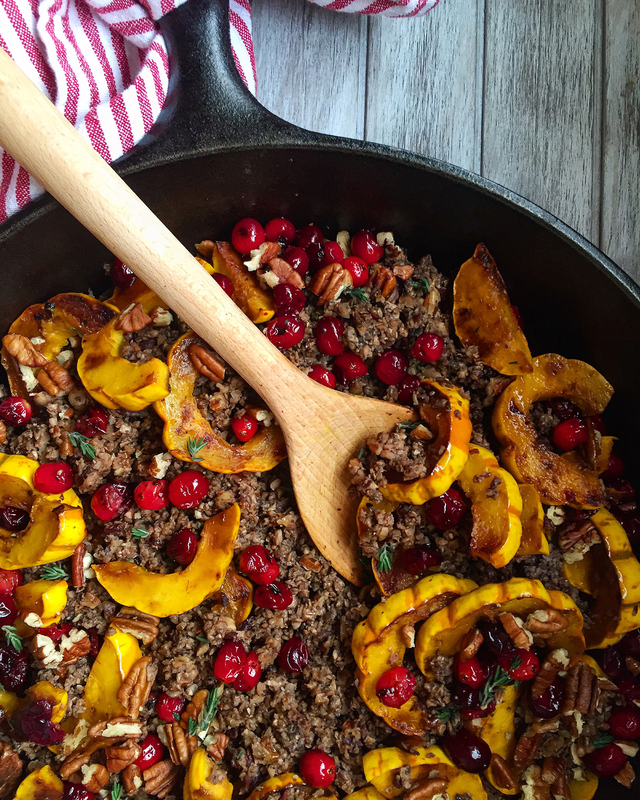 Add the cooked delicata squash and cooked cranberries back to the skillet and toss to combine. Chop the pecans (or pulse in a food processor) and add to the hash along with the thyme and toss to combine. Remove from the heat and set aside for 10 minutes to allow the flavors to meld, then serve warm. Sound delicious. Thanks for sharing. Any hash with cranberries is my kind of hash!! This looks amazing Rachel You’ve I would have never thought to combine duck bacon with all these seasonal ingredients! Well done. I have NEVER heard of duck bacon, but now I need some! Thanks for the recipe – I have pinned it. Looks AMAZING! I love duck. This looks so fabulous. There’s a restaurant I want to go to in Portland ME called duck fat. Everything is fried in duck fat… yummmmm. Wow, that is an AWESOME concept for a restaurant! Wow! that looks scrumptious!! Now I’m hungry! Great post, thank you for sharing! You can make bacon from duck!? Blown away, and wow what a great giveaway! Yes, it’s a wonderful world. Duck bacon ftw! This looks – and sounds – absolutely delicious! I’ve never had duck bacon before so will definitely have to give it a try this holiday! Thanks for sharing!